Your humble blogger has visited Jeff Olson at the hospital...as noted earlier, Jeff is a fabulous musician with Folks Together, and has been involved with various musical projects with your humble blogger and others in the area. Jeff was striken with Legionnaire's disease, and was in a very serious fight for his life--but, as expected by those of us who know and love him, he was able to beat back the threat. However, although he's out of intensive care (as of a few days back), he's going through a difficult recovery in the hospital. So please remember him in your thoughts and prayers. A benefit concert is being planned for early October at the Narrows. Watch this space for more information. Got the word that former Sarah Borges' guitar god, Mike Castellana, left the group due to his wife having their first child very soon..
and he is playing with a group called the Glory Tellers with whom he's going to tour Europe very soon. Best wishes, Mike. Maybe the Glory Tellers will be coming to the Narrows in the future. Congrats to you, your wife and your baby boy Caetano (due to arrive October 30). Who knew? That a Neil Young tribute group made up some of the better known Rhode Island area musicians would have drawn such a crowd? Forever Young did just that on Saturday night at the Narrows. Created by John Fuzek (left photo) and starring (in upper photo, l-r) Becky Chace, Dan Lilley and Mark Cutler, the ensemble, backed by several other musicians, put the pedal-to-the-metal for Neil Young songs such as "Heart of Gold" and "Harvest Moon." Narrows program manager Deb Charlebois was a busy person this week, bringing in a bunch of fancy new tables and chairs. She and president Patrick Norton--with the support of our board, our volunteers and many nice folks in the community--continue to class the place up! Over the past 12 months or so, here are the improvements: new sound system, new lighting system, installation of an elevator, installation of ceiling fans, new accessible bathroom (with more bathrooms to come)--has your humble blogger missed something? It's not often that we get a female electric blues player at the Narrows--in fact, Friday night was perhaps the first time (the great Rory Block is an acoustic blueswoman who has played the Narrows a bunch of times). So Debbie Davies and her group showed how to play what some might term "Chicago blues" with a female being the "guitar god." Or make that "guitar goddess." Debbie Davies certainly was that, although her interaction with the audience was more like somebody who lived next door to you. Imagine if you lived next to Buddy Guy, Albert Collins etc. and they came to your house to borrow your lawnmower. If you missed her this time and are an electric blues fan, be sure to catch her in the future. She's got the chops! 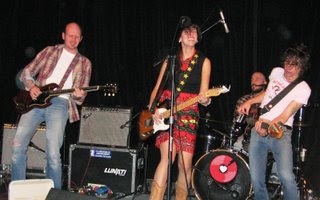 Narrows' faves Sarah Borges and the Broken Singles have a new guitar player: Lyle Brewer. He's a young roots cat whom you can see at his myspace page right here. Thank you for all your thoughts and prayers for Jeff. I guess they're working! The latest word I have is that Jeff has come out of his coma and is eating normally, and that he's out of immediate danger. His longterm prognosis remains to be seen, but it is much more positive than a few days ago. He will remain in the hospital for the near future as his recovery continues. One of the more beautiful voices echoed in the Narrows' rafters Saturday night as alt-country singer,songwriter,guitar strummer Laura Cantrell made her debut. Narrows fave Jimmy Ryan was the opener and side-guy for her. Laura hasn't been gigging much in recent years, she explained, because she became a mom and has been sticking close to her New York digs. She played tracks from her latest CD "Trains and Boats and Planes" and other selections. Friday night was the debut of Watermelon Slim and the Workers at the Narrows. It was more the stories, the personality and the showmanship of the group that made the evening a delight. Watermelon Slim's personal history, which you can read on his website, informed the performance, which was filled with passion, humor and occasional wackiness. Of particular note is Watermelon Slim's blues song for his friend Howard Zinn, probably a first! Probably one of the best, most comprehensive articles about the Narrows has been published by the Patriot Ledger, up there near Boston. Your humble blogger asks that you continue to send your thoughts and prayers to Jeff Olson and his family. See previous entries for more info about Jeff. The latest is he's showing some improvement but is still in very serious condition and is in a coma. I'll post information here when it becomes available. Thank you for all the thoughts and prayers for Jeff Olson. The word I've received is he showed some improvement Friday. Jeff is a wonderful songwriter, musician, singer, producer etc. who is best known for his work with Folks Together, which has played the Narrows a time or two. Jeff also has volunteered at the Narrows. Jeff is one of the good guys you'll come across in life. He was hospitalized a few days back for Legionnaires, and his prognosis was not positive. Please keep him and his family in your thoughts and prayers. I'll keep you posted on his condition. Chris Hillman (Byrds, Flying Burrito Brothers, Manassas, the Desert Rose Band), left in photo, and Herb Pedersen (Desert Rose Band, and other groups with the likes of Jerry Garcia) took their two-man tour to the Narrows' Friday night. They played the roots of what became country rock and arguably the roots of some of today's country music as well as alternative country or Americana. These guys met back in their late teens, and have been together on various projects ever since, including the Desert Rose Band, which is reuniting for a few gigs very soon. Highlights included "Turn Turn Turn," lyrics by, as Chris noted, King Solomon, "Eight Miles High," as well as "If I Could Only Win Your Love," which Emmylou Harris and Herb had a country hit with as a duet. Chris played mandolin and guitar during the show, and Herb played guitar. Both united for gentle harmonies. Your humble blogger snapped the above photo "backstage" (actually in a room behind the audience) a few minutes before show time. After the concert, Chris and Herb were generous with their time, signing CDs etc. and posing with fans for photographs (including one with your humble blogger). Jeff Olson, one of the greatest musicians and gentlemen I've ever known, is in very serious condition and is in intensive care at an area hospital. His wife Donna called me and asked that everyone send out their thoughts and prayers for his recovery. He was stricken a few days back with what appeared to be pneumonia, but turned into a more serious situation. 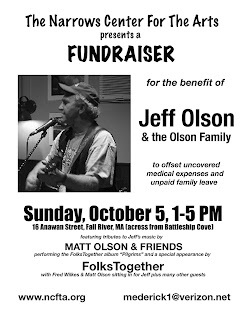 Jeff is a member of the folk group Folks Together, which has played the Narrows a number of times. 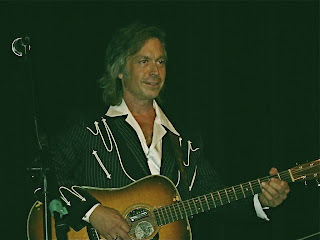 The Narrows Festival of the Arts is coming up September 7 and will feature a nominee for Americana Artist of the Year--our guy Jim Lauderdale. Above is a photo of Jim performing at the Narrows. Tell your friends and bring the kids, too. Fab guitarist with Sarah Borges and the Broken Singles, Mike Castellana (far left in the photo at the Narrows), leaves the band in mid-August. Mike has been incredibly important to the group's sound and will be missed greatly. No word on why he's leaving or who is replacing him, as the group prepares to head to the studio to record their 3rd CD. Mike really could do no wrong, as far as your humble blogger is concerned. He knew when to play, when to pause, and when to let loose. Very tasteful and a nice guy too. Best wishes Mike from your friends at the Narrows! We are very proud to note that mvyradio.com has posted the Narrows' Walter Trout show and the Greg Brown show on their website, for your listening pleasure. Your humble blogger's voice makes a very brief appearance at the beginning of both. Check the shows out here. The wild and wacky Asylum Street Spankers, from deep in the heart of Texas, paid a visit to the Narrows Thursday night, expounding on the evils of weed wackers and demonstrating that roots music and theater can co-exist on the same stage.